Transition from dowels to small retrieving dummies. Touch the dummy or lift it slightly when first transitioning from the bench to the ground. Force breaking isn't always fun, but it works. Do you really need to force break your dog? I don't have an easy answer to that question. What I do have, however, are situations. There was a time when I thought all pointing dogs should be force broken. (The politically correct term these days is "conditioned retrieve," but I'm a crotchety geezer, so "force breaking" it will be.) After all, virtually every pro Lab trainer in the country force breaks his dogs, and Labs are a breed with more drive to retrieve per cubic inch than any other animal on earth. The Lab guys' rationale is control. Lab guys know that sooner or later their dog will either refuse a retrieve or concoct some weird variation of a retrieve that requires a correction, and force breaking allows them to do that. Proponents of natural retrieving, on the other hand, claim that force breaking can ruin a dog's drive. But among the pointing dogs I've force broken and all the dogs I've seen other competent trainers force break, I've yet to see that happen. That isn't the whole story, though. This summer, two of the dogs I trained were natural retrievers. This was a pleasant surprise after training dogs for years that had no desire to retrieve at all. I didn't have sufficient time to force break the first, a Brittany. The second, an English pointer I own, was retrieving so well I decided to run with it. Both are now in their first season, and both seem to be developing into fairly reliable, natural retrievers. But during my annual trip to Wisconsin this past autumn, Tango, my pointer, began refusing woodcock. That's not unusual--many dogs seem to dislike the quirky bird's taste--but if I'd force broken her, I could have corrected that minor flaw then and there. As it was, I was out of luck. Still, if force breaking almost always works, why not do it with every dog you train, regardless of natural ability? By and large, that's what I do. But consider this: Force breaking is simply not much fun. The dog hates it, most trainers hate it and it takes a long time. If you have a dog that retrieves naturally, it may be worth an occasional refused retrieve to save yourself the hassle. But only you can make that decision. If you decide to go the force-breaking route, here's how I do it. My way is by no means the last word on the subject; I've borrowed techniques from a number of different sources, including an entire book on the subject by Evan Graham called Smart Fetch from RushCreekPress@aol.com, and a DVD by George Hickox, "Training The Upland Retriever," from www.georgehickox.com. I still use the traditional ear pinch; a toe hitch or e-collar are just as effective. Here's what you'll need: a one-inch wooden dowel six or eight inches long; a couple retrieving bumpers, one small and one large; several dead, frozen pigeons; and a supply of live birds. A bench or table that raises the dog off the ground is handy but not absolutely necessary. Most important, you'll need time. Figure six weeks minimum; two months or even longer is likely. Start with your dog on the bench, if you have one. I've got a pair of vertical two-by-fours screwed to either end of my bench, one of which I use to secure the dog's head with a short lead. Tying his head isn't mandatory, but it will sure make your job easier. First, get him used to the idea of holding the dowel in his mouth. Pry open his mouth with your thumb, insert the dowel and command "hold it." Then stroke him under the chin to keep his head up while you repeat the command. After a few seconds, let him spit it into your hand on the command "give." He'll be happy to get rid of it. Do this for several days, stroking his chin until he starts to relax. Don't let him lower his head or spit out the dowel before you ask for it, and don't let him sit. Now comes the hard part. Hold the dowel in front of the dog's mouth, grasp his collar and ear with one hand, lay his ear over the buckle on his collar and press his ear into the buckle with your thumb. Then say "fetch." He's not going to like this and will probably fight you; that's why you have his head tied to the post. When he finally opens his mouth to complain, push the dowel in and immediately release the pressure on his ear. Follow that with the "hold it" command while you stroke his chin, and follow that with the "give" command when he spits the bumper into your hand. Some dogs won't open their mouths no matter how hard you pinch their ear, and others will scream bloody murder. If so, you'll have to ratchet up the pressure. Try pressing your thumbnail, rather than the pad of your thumb, into the dog's ear (again, against the collar buckle). The minute the dog opens its mouth to howl, I shove the dowel in. Congratulations; you're now over the worst of it. Unfortunately, the rest of the process isn't exactly a bed of roses, either. Once your pup is voluntarily grabbing the dowel without ear pressure, hold it a few inches from his nose and make him reach for it. If that flies, lower the dowel a few inches; your eventual goal is to get him to pick it up off the bench. Apply ear pressure as needed, but he should now understand that refusing to open his mouth results in ear pressure, so give him the option to do it without pressure first. When he'll pick up the dowel off the bench on command, you're halfway home. Put your pup on a check cord, take him off the bench, place the dowel on the ground in front of him and grab his ear. Give him the command to "fetch." He'll refuse, so pinch his ear and force his head to the dowel. For some reason, it usually helps to keep your fingers on the dowel, perhaps lifting one end off the ground so he can grab it easily. Eventually, you'll be able to remove your hand and toss the dowel a few feet in front of him, increasing the distance until he's making retrieves at 20 or 30 feet. Keep him on the check cord, and if he refuses, haul him in, pinch his ear and lead him to the bird. 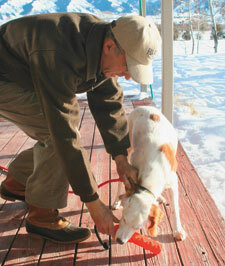 Don't be surprised if your pup retrieves nicely for a few days and then quits. They all do that. Keep after it until he's retrieving more often than not. Now is the time to go back to the bench and introduce bumpers and birds. You'll go through exactly the same process with each new item: the ear pinch followed by the "fetch," "hold it" and "give" commands. Start with a small plastic or canvas bumper, then transition to a large plastic or canvas bumper and finally to a frozen pigeon. Expect the dog to refuse both the large bumper and frozen pigeon, but don't quit now. When he'll hold any object you present to him, it's time to take him back off the bench and into the yard. Start with a large bumper and finish with a frozen pigeon. Throw the bumper or dead pigeon, give him the "fetch" command, and be ready to reinforce a refusal with an ear pinch. Note: Most dead pigeons are good for only a few days in hot weather, so you'll probably need at least a half dozen of them. Don't use a bloody, chewed-up bird. The dog will be much more amenable to retrieving if the bird is reasonably fresh. Somewhere around this time you may discover that your dog has actually begun to enjoy the process--retrieving birds is fun! Either way, once he's reliably fetching dead pigeons, capitalize on your momentum by shooting some live birds over him--I typically shoot 10 to 15 birds to finish the process. If you're lucky he'll retrieve them all without an ear pinch; but it's more likely he won't, so keep your thumb loaded and resting lightly in your holster. You've made it! But before you crack open a celebratory beer, you've still got some work ahead of you. In the field, most force-broken dogs refuse their first few freshly killed gamebirds, so be ready to apply a quick, remedial ear pinch. Never, ever give your pup the option of not retrieving and he'll eventually accept it as part of his job. And that, in my opinion, is exactly as it should be.